Cauliflower is a staple in the low-carb/high-fat community, where it is used to fill the void where the potatoes, rice, or pasta used to be. Here’s proof that it can outshine its starchy counterparts. It doesn’t have to imitate anything and it certainly doesn’t need to be boring! Move over, ho-hum sides. Meet my new love! 3 oil-cured Calabrian chilies, seeded and cut into thin strips, or ½ teaspoon dried red pepper flakes. Preheat oven to 425 degrees. Toss cauliflower with 3 tablespoons of the olive oil on a rimmed baking sheet. Sprinkle with salt and pepper. Roast, stirring occasionally, until tender and golden brown, 25 to 30 minutes. Place remaining 2 tablespoons of olive oil in a medium saute pan. Add bacon or prosciutto and cook, stirring constantly, over medium heat until crisp. Drain and set aside. Put butter in a medium saute pan over medium heat. When butter begins to brown, add the preserved lemon skin. Cook and stir until lemon begins to crisp. Stir in the chili strips or flakes and olives. Allow to cook for about 20 seconds. Add bacon or prosciutto and heat through. 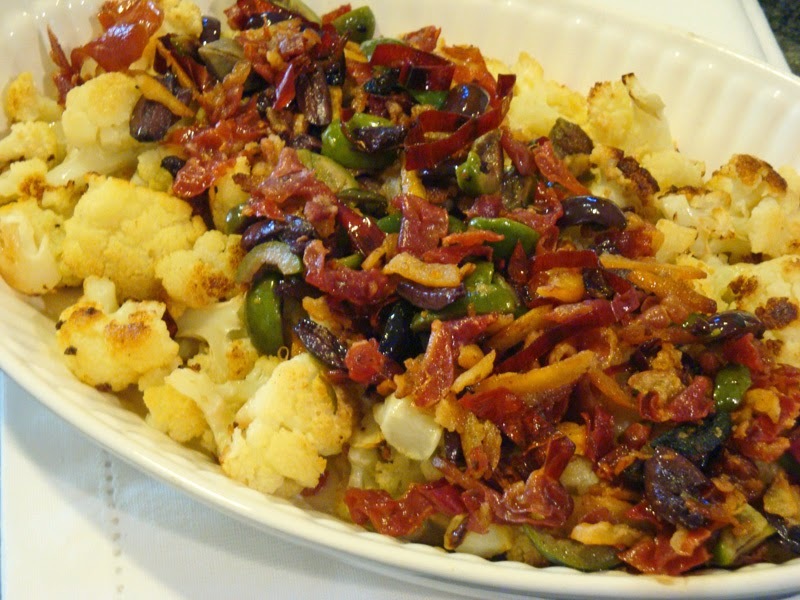 Transfer roasted cauliflower to a heated serving platter and top with bacon, lemon, chili, and olive mixture. Serve hot. *NOTE: Preserved lemons can be purchased or made by my recipe. Another option is to use this shortcut from my friend and fellow IACP member, Carol Dearth. Carol is the owner of the Sizzle Works Cooking School in Bellevue, WA. See her directions, below, for a quick version of preserved lemons. It is part of another version of a recipe for Roasted Cauliflower with Preserved Lemons on her blog. Cut lemon in half, lengthwise, then slice crosswise paper thin, discarding seeds and ends. Cut slices in half again. In a bowl, mix lemon with salt. Let stand 15 to 45 minutes. Rinse, drain, and store in refrigerator. Bacon, Chilies, Olives, Preserved Lemon Peel. Bookmark.